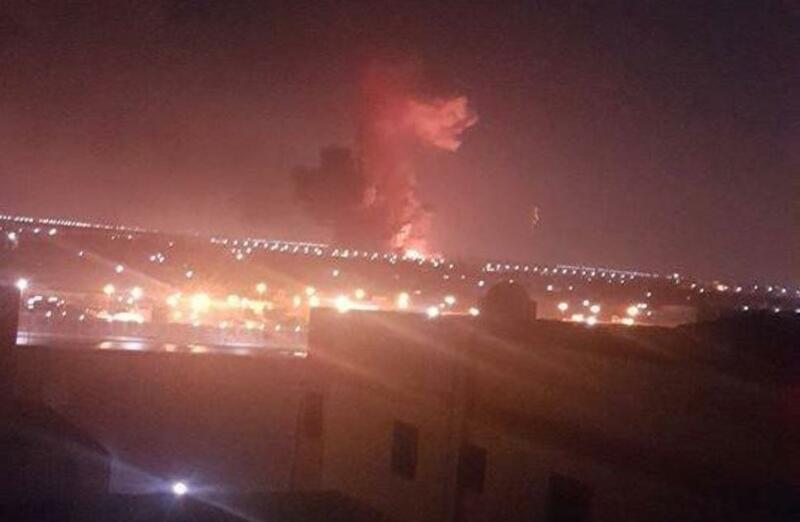 A chemicals factory went up in a fiery explosion Thursday outside of Cairo's main airport. A dozen people were injured in the blast which was caused by high temperatures, according to an army spokesman. Egypt's state news MENA reported the 12 injured victims were taken to a hospital. The blast occurred at a storage facility owned by a local petrochemicals company in northern Cairo. Egypt's minister of civil aviation, Younis al-Masri, reported that air traffic was operating normally and was unaffected by the blast. Witnesses reported hearing the blast from the city's main airport. Egyptian military spokesman Colonel Tamer al-Rifai said, "Due to high temperatures, an explosion happened at a petrochemicals storage belonging to the Heliopolis for Chemical Industries. Civil defense trucks were deployed to bring the fire under control." It is not clear who owns the factory but some internet posts indicated it could be connected to the armed forces. Black smoke rose over the entire area as emergency responders rushed to the area. The fire was soon brought under control by firefighters according to state television. Egypt has been struggling with an onslaught of Islamist militant insurgencies which have been targeting mainly remote structures in the Sinai Peninsula. The Egyptian army has been defending against the militant attacks in a security operation since February. With the increasing summer heat, the attacks have slowly waned and there have been no new incidents reported in recent weeks.